Go wild and visit the UK’s largest zoo, home to over 2,500 animals! 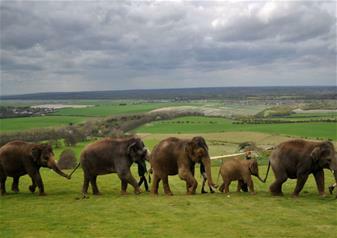 ZSL Whipsnade Zoo is located in the stunning English countryside across 600 acres of sprawling fields. See animals both little and large and learn about their lives during an exciting day out at Whipsnade Zoo. The Zoo’s animals include ferocious lions and tigers, huge elephants, hippos, zebra, chimpanzees, rhino, brown bear, penguins and lemurs. A brand new visitor centre will welcome you to the Zoo; the perfect place to start a day of exploring. Visitors to ZSL Whipsnade Zoo can learn more about the animals during daily talks and live demonstrations. Watch the keepers interact with sea lions, brown bears and elephants in their enclosures. See eye to eye with a towering giraffe at Giraffe Heights! The nine foot high viewing platform lets visitors ascend to the same height as the tallest mammal in the world. Imagine what it’s like living this high off the ground! Little ones can meet and greet a whole host of farmyard friends at Hullabazoo Farm. Pet the Zoo’s miniature donkeys, Trevor and Tulip, and a family of pygmy goats, Gloucester old spot pigs and piglets, sheep and lambs, bunnies, guinea pigs, ferrets and cute chicks. ZSL Whipsnade Zoo opened a brand new butterfly house in 2015. The immersive new walkthrough will let visitors explore the habitats of these delicate and beautiful insects.